Often now I hear of Christians speaking of justification to take up arms against tyrants when it seems what Jesus said in the New Testament that we should not. We live in a secular world and it is not our role to police it. Governmental institutions have been set up to administer the law to evil doers. But what about tyrants? Is there a right to resist them or are we to use the existing institutions? Back in the nineteen-sixties and seventies, Central American Jesuits designed posters to motivate [peasants] to overthrow corrupt politicians. 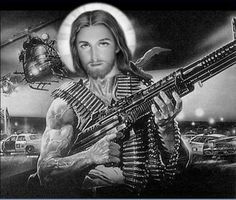 The posters for this Bellarminian liberation theology depicted an angry Jesus Christ in the image of Che Guevara, swathed in fatigues, draped in bullet-belts, holding a submachine gun at the ready, a Rambo Jesus, a Jesus whose Sacred Heart called for social action that included killing. The American bishop scare aroused the same dynamic in the 1770’s. What was considered by many to be the most influential sermon on the subject was preached to Boston’s Ancient and Honorable Artillery Company by Rev. Jonathan Mayhew’s successor at Harvard, Rev. Simeon Howard. Simeon Howard received his early preaching experience in Nova Scotia – or Acadia, as the French settlers called it. He experienced first-hand the uprooting and expulsion, by British soldiers, of some three thousand French Catholic Acadians, along with their Jesuit priests. Cruelly, often violently, the Acadians were forced to emigrate to various American colonies, with no compensation for property or livestock. (Longfellow memorialized the event in Evangeline). With a casuistry [the use of clever but unsound reasoning] that would have delighted Cardinal Bellarmine, Rev. Howard’s famous Artillery Company sermon openly advocated the use of violence against a political tyrant. Our duty to defend personal liberty and property, he argued, is stated in Scripture at Galatians 5:1 – “Stand fast therefore in the liberty wherewith Christ hath made us free.” True, Rev. Howard admitted, Christ requires us to “resist not evil – love your enemies, do good to them that hate you” (Matthew 5), and “recompense to no man evil for evil – avenge not yourselves” (Romans 12, 17, 19). But these precepts apply only to cases of “small injuries,” Howard said, not large ones, such as tyranny. This is what the scriptures have to say on this subject. Christ said to Pontius Pilot (John 19:11) “…You could have no power at all against me, except it were given you from above…”. Clearly He was showing him Who was really in charge. The authority is given to evil rulers to rule well over all including God’s people. Even the nation of Israel was subject to evil rulers, for example, during the time of the Egyptian (400 years) and Babylonian (70 years) captivities. What follows in Roman 13, after those verse ordering our obedience to the “powers that be” and to pay our taxes, is those aspects of the law that God expects all Christians to obey first and foremost in regards to our fellow-man. F. Tupper Saussy, Rulers of Evil, Useful Knowledge About Governing Bodies, Ospray Bookmakers, Reno, Nevada, pp. 150,151, 1999. 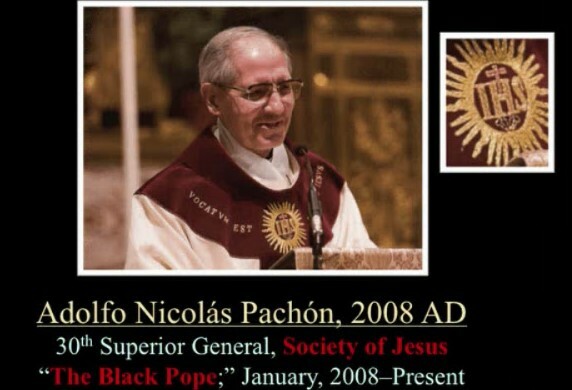 The black papacy means the Superior General of the Society of Jesus, the real power behind the scenes in the Vatican. This entry was posted in Biblical doctrines, Church History, Roman Catholic Church, The Papacy and tagged armed resistance, Bellarminian liberation theology, Black Pope, Cardinal Bellarmine, Church of Rome, John Hartnett, live by the sword, Papacy, Roman Catholic Church, sword. Bookmark the permalink.